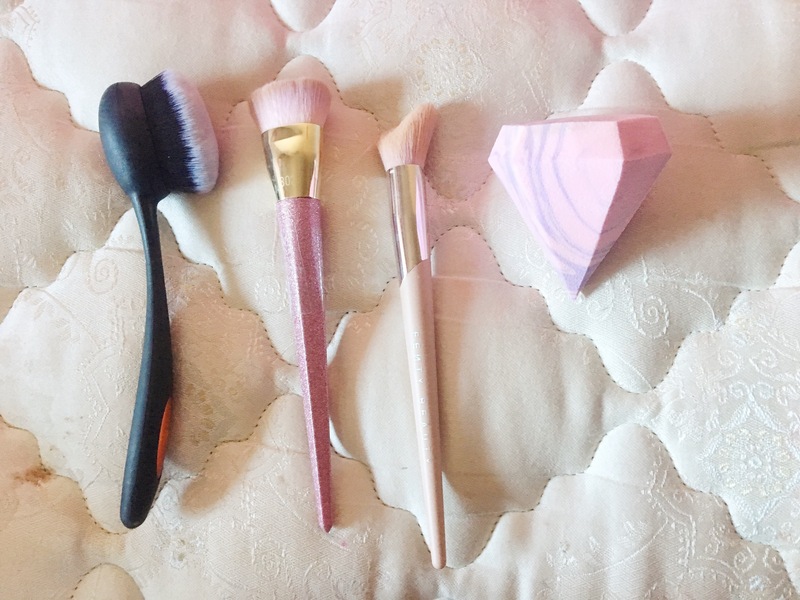 There are some makeup brushes and tools out there which have an interesting shape that made me a little bit curious about them and I thought I’d look into them! These are my thoughts on the products. I’ve been waiting for a great dupe for the Artis oval brushes (a.k.a. hair brush brushes) which are very expensive! – for some time. I’ve seen plenty out there but when I heard that Real Techniques was coming out with one I knew that was the one I had to get! The quality of their brushes have never let me down. The actual brush handle is very strong so it doesn’t leave me worrying the brush head is going to snap off like with some dupes I’ve heard of. The brush hairs are very dense, and they did give me much more coverage with my lighter coverage foundations than your typical brush. I will say though that it was very difficult to wash compared to other brushes I’ve used. This highlighter brush that some people say looks like a “shark tooth” from Fenty Beauty applied highlighter in a unique way. The brush made highlighters more pigmented but I noticed didn’t they last as long as when I applied them with other brushes. I think this might have to do with the way the brush picks up and distributes product. The handle is very nice and sleek quality. The contour brush is great if you want a very sculpted and defined contour due to it’s shape. It applied my contour so much faster and easily than normal. The handle is sparkly but luckily you can’t feel the actual sparkles on the brush and it feels heavier and more luxe than your average brush. I wasn’t as fond of the Diamond sponge as I wanted to be (it’s a beauty sponge that’s pink and in the shape of a diamond!) While the feel of the sponge was very soft and absorbed the water decently, the angles were too hard to use to blend out foundation and concealer the way I’m typically accustomed to and it absorbed too much product. Overall, it wasn’t my favorite blender sponge. Next Four Days of Face Masks: Are They Worth it Or Not? I’m really interested in the oval brush too. Great post! It’s a good one if you want full coverage! And thank you! !